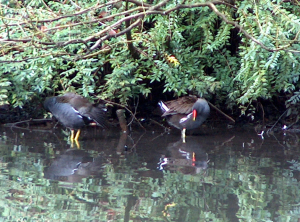 Observation - Moorhen - UK and Ireland. Description: Originally observed black feathers with flashes of white. Thought it was a coot. Then noticed beak was red and yellow. Originally observed black feathers with flashes of white. Thought it was a coot. Then noticed beak was red and yellow.